This module contains three separate adventures, all leading to the common goal of establishing a new CC base near Big Sur, California. In Adventure #1, you ride shotgun up the Pacific Coast Highway, escorting a shipment of critical supplies to the new location. Adventure #2 takes you to San Francisco to recover a lost comrade from amidst the ruins, the survivors, and the enemy. Finally, in Adventure #3, you must obtain a supply of rare earth minerals needed to create a CYBORG COMMANDO™ character from a remote location in the Mojave Desert. But the mine and processing plant are now threatened by an unexpected infestation of alien Xenoborgs! When we last left our intrepid heroes, they had endured severe exposition and spent almost a week walking across one-and-a-half continents. At the Primary base in Mazatlan, Mexico, they are greeted by the acting base commander, Captain Sanchez. San Francisco Knights employs the convention of using boxed text to indicate sections that should be read aloud by the Game Master. One such section is Sanchez' instructions to the player characters. However, prior to this, we are treated to a description of Sanchez' office: “a small room decorated with sequined sombreros...” The only characterization afforded to a Mexican NPC is that his office has “sequined sombreros.” Really? Why not begin his soliloquy with, “¡ Hola, mis amigos! ”? Why not have him whistle “La Cucaracha”? This is from 1987, so I'm not calling it out for cultural insensitivity. Instead, I'm calling it out for being astoundingly stupid. If you want to assign a cultural identifier to Sanchez (and this does not seem to have been the original intent), put a Frida Kahlo print in his office or something. ¡Dios mío! Anyway, the action for the first adventure begins at the Malibu “home of movie star Cliff Hamlin.” There are three supply trucks that the players must accompany and “run interference for.” Before the convoy begins, a young man – disguised as an old drunk – steals one of the trucks. Meanwhile, his six compatriots (or maybe only five compatriots – the text is inconsistent) fire rifles at any pursuers. Are they stealing a truck because a bunch of orphans and wounded people are in desperate need of supplies? Nope. They just want a ride to Santa Maria and think that the best way to accomplish this is by attacking cyborgs. In the second adventure, the player characters go into what's left of San Francisco to salvage equipment from the (now partially submerged) Cyborg Commando base. More to the point, the player characters are supposed to retrieve an older-model Cyborg Commando with whom contact was lost at the time of the invasion. Since every Cyborg Commando “is an expensive piece of equipment,” it makes sense that a tracking mechanism would be installed. Of course, there is no tracking mechanism; such a thing would invalidate the purpose of the adventure. 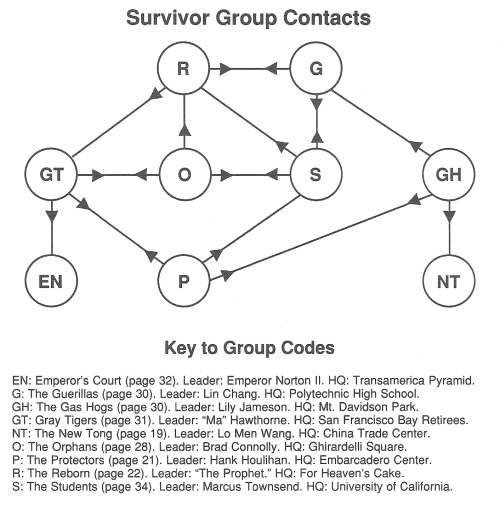 Each survivor leader can direct the characters to two to four others, who may or may not have the information desired. This gives the characters several options from which to choose, rather than forcing them along a particular path. A diagram of the information network is given below. loses his hands in an explosion. These events are inviolable. So, the adventure does not force the players “along a particular path,” but it does require a specific ending. The third adventure transpires a month or so after the invasion. A “mine and processing plant” for rare earth minerals remained functioning after the invasion. Now, however, shipments have stopped and xenoborg activity is suspected. Contrary to the back cover text, the xenoborgs are hardly “unexpected.” So, the player characters must defeat the xenoborgs plaguing the facility. The plot is straightforward and there are no instances of nonsense. A significant amount of detail is spent on the conditions of towns and roadways between Big Sur and the facility. Also, unnecessary detail is provided about extracting rare earth minerals from raw ore. For instance, “During this process, soluble trivalent cerium is converted to insoluble tetravalent CeO₂.” This information serves no purpose in the adventure. Many campaigns begin with the expediency of murderhoboes meeting at a tavern. 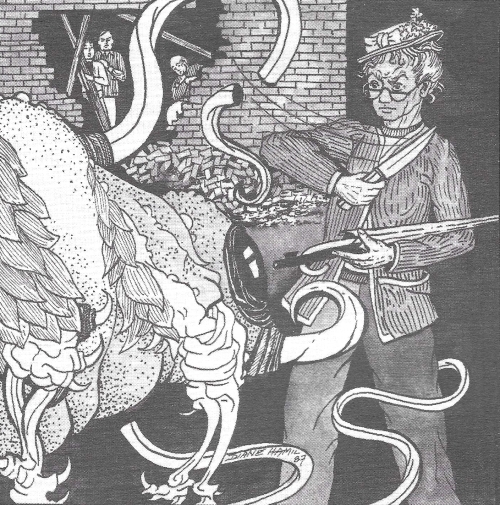 Some campaigns – like the default Year of the Phoenix setting – require that an intricate backstory be presented before player characters actually have any agency. The campaign presented in the first published adventure for CYBORG COMMANDO™ is among the latter type. San Francisco Knights, released the same year as the CYBORG COMMANDO™ boxed set, is credited to Penny Petticord. Known for being administrator for the RPGA network as well as editor for POLYHEDRON, Petticord has no other non-periodical credits in gaming. The adventure was edited by Pamela O'Neill, co-author of the CYBORG COMMANDO™ tie-in novels. The GM's Adventure Notes from the boxed set suggests that starting adventures should feature the home town of the players. 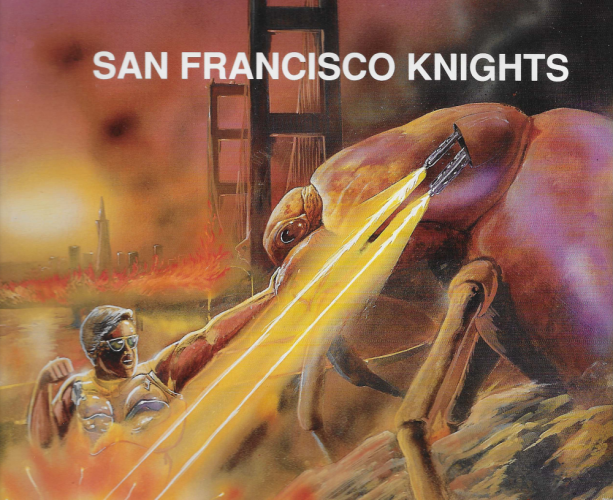 “For impact and realism,” it reads, “bring the early action from the starting base into your home town.” Also, “To practice the details of the game, run a few simple fights with aliens in your home town.” San Francisco Knights, however, takes a different approach. The adventure assumes that up to three of the player characters are assigned to the San Francisco CCF base. The Campaign Book specifies that precisely three Cyborg Commandos are assigned to the base, so I guess it wouldn't be realistic to have a couple of additional player characters present. (There is also a non-player, older model cyborg at the base.) Six pre-generated characters are provided with the adventure, three of which represent the titular Knights. It all started three days ago, on January 11, 2035. The sun rose over the famous San Francisco skyline as usual, bathing the still sleeping city in various shades of gold. Inclement weather causes the player characters' jet to crash land somewhere in South America. “By the next morning,” the players learn, “your underwater propulsion legs...brought you to the icy waters of the Antarctic.” It is at this point where the San Francisco cyborgs team up with other player characters (if any). The cyborgs recover videotapes from a Trans-American Union station that show “not a meteor, but rather a device of unfamiliar manufacture, hurtling though the atmosphere...” The player characters then defeat “a huge, misshapen version of an insect,” bristling with weapons. The cyborgs make their way toward the U.S., discovering that CCF bases on the way have been destroyed. Eventually, they find an operational base “at Mazatlan, Mexico on the morning of January 17.” Wait. Wasn't January 11 just three (or two) days ago? CYBORG COMMANDO™ doesn't seem to track the passage of time very well. All of the preceding, from January 11 to January 17 (I guess), was backstory. The players had no opportunity to engage with these events; they couldn't ask questions during the mission briefing, they couldn't fight the monster – nothing. Why? What's the point of this elaborate info dump? Well, kids, it's like this. The whole alien invasion scenario is the sine qua non of CYBORG COMMANDO™. The player characters can't affect that. However, instead of sending the PCs on an excursion to Antarctica without an iota of agency, I would have handled things differently. Let's say the player characters are involved in excavating a CCF security bunker in the side of a mountain. The Xenoborg attack causes a cave-in. As the PCs extricate themselves, they find they are in a cat-and-mouse game of survival against the aliens in an underground network of tunnels. In this way, the player characters are out of the big picture, but at least they get to do something of their own volition – namely, “a few simple fights with aliens” as recommended by the GM's Adventure Notes. The premise of CYB✪RG C✪MMAND✪™ – heroic individuals undergoing a dangerous, experimental process in order to fight invading aliens – is good enough. Unfortunately, the game does not implement this premise in an especially engaging way. A better implementation of this premise can be found in the Strikeforce Morituri series published by Marvel Comics. 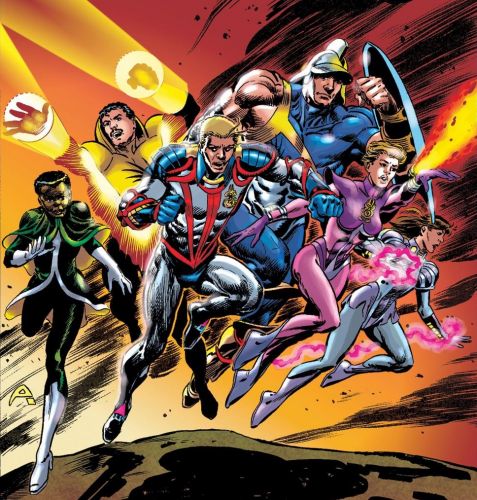 Created by Peter B. Gillis and Brent Anderson, Strikeforce Morituri began publication in 1986, the year prior to the release of CYBORG COMMANDO. The story begins in 2072, four years after an extraterrestrial race, the “Horde,” began their depredations upon the Earth. Human technology is no match for Horde technology. Thus the Horde launch pillaging raids from their orbital base and several land bases without fear of reprisal. The Horde have no interest in exterminating humanity or conquering the world, they just loot whatever civilizations they encounter. Still, they have more personality than CYBORG COMMANDO's Xenoborgs. The Horde use psychology against humans and Gillis does a good job of demonstrating their cruelty. The Morituri represent the only hope humanity has against the Horde. Only a select few are accepted to take the Morituri Process, which has two phases. Phase one enhances the subject's physiology and grants increased strength so as to withstand the stress of the next phase. Phase two imparts a super-power to a subject, the exact nature of which is impossible to predict. Eventually, every Morituri subject will reject the enhancements with fatal results. Hence the name “Morituri,” which comes from the Latin phrase nos morituri te salutamus (“we who are about to die salute you”); a phrase attributed to gladiators. Whether or not any gladiator actually made that remark is immaterial to its relevance to our protagonists. Ideal Morituri candidates are expected to live up to a year before the process kills them. The “up to a year” lifespan is taken for granted, even though this assumption is made before any Morituri subject has survived for nearly that long. It seems to be wishful thinking or perhaps we as readers are supposed to suspend disbelief in this regard. The Morituri enjoy a celebrity status, which is as important (if not more so) than their actual military accomplishments. In testament to this, the commander of the Morituri squad is not a Morituri herself, but had experience in the entertainment industry prior to the invasion. This is the type of dramatic element of which CYBORG COMMANDO does not take advantage. A game based on Strikeforce Morituri would seem to offer a richer experience than CYBORG COMMANDO's “setting.” This is especially true in that there is little to distinguish CYBORG COMMANDO characters for one another while each Morituri subject has a different power.